Soil Conditioner, Slowly Water Soluble and Highly Suspendable Fine Powder. Soil calcium deficiency, soil crusting, high soil salt index, high salt index irrigation water, poor internal drainage of soils, compaction, poor soil tilth, etc. Apply through Irrigation: Sprinkler, Drip or Pivot. Creates many benefits for poorly drained, crusty soils, maintains and remediates soils “salted” out from poor irrigation water, generally improves soil texture and tilth. An interesting example – This product has been used in peanut production to prepare soils for harvest. At peanut harvest the “stickiness” of the soil can cause a loss of production, especially in wet conditions. Any clodding of the soil can pull peanuts from the vine as they are being dug, making them unharvestable. 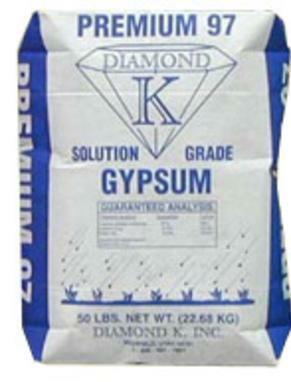 Diamond K Gypsum, applied through the pivot, can make the soil much more pliable and loose under these adverse conditions, leading to reduced harvest losses/higher yields.